Here is a simple dinner menu for a summer evening — you could serve a green salad to start and fresh peaches with sabayon or vanilla yogurt for dessert — of course, you need to serve a light red Italian wine with this rustic dish. 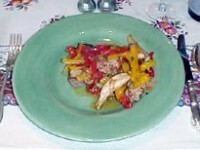 Rub the chicken pieces with olive oil and sprinkle with salt and pepper and cut into 1/2-inch chunks. 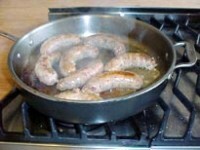 Prick the sausages with a fork and place them in one layer in a saute pan with 1/2 inch water. Heat slowly to release some of the fat, then increase the heat and cook the sausages until golden brown all over. 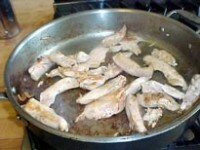 Remove the sausages from the pan and cut into 1/2-inch chunks. Pour off all but 2 Tbs. of the fat. Add the onions and peppers to the pan and cook for 3 to 4 minutes until soft. Then add the garlic and red pepper flakes and continue cooking another minute. Add the Italian parsley and salt and pepper to taste. When the vegetables are slightly softened, pour them into a stainless steel bowl, add olive oil to the pan, and cook the chicken pieces over medium high heat a minute on each side. Add the white wine and cook over high heat for another minute. Add the cooked sausages and the pepper mixture and warm through. Taste and add salt and pepper to taste. Cover and keep warm while making the bruschetta. 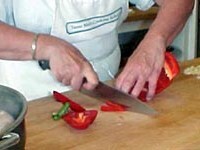 To make the bruschetta, cut a large loaf of Italian bread into thick slices. Broil these until golden on both sides. Rub one side with a cut clove of garlic and brush it with olive oil. 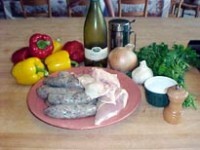 Place the bruschetta on warm dinner plates and spoon over the sausage mixture.